It is time once again for our network to pump out gift guides for the holiday season, prodding you to buy and consume like all the other sheeple. However, no one made a gift guide for us, the people who write Jalopnik. Thankfully, SpeedSource’s auction has us covered. The diesel Mazda6 is for sale, and we’re still head-over-heels in love with that car. 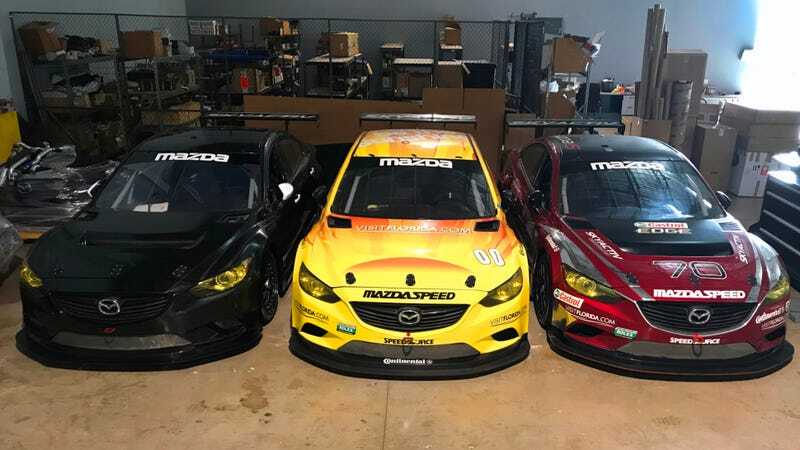 SpeedSource used to handle Mazda’s main North American Grand-Am and IMSA teams. However, the Sylvain Tremblay-owned shop closed its doors after Mazda shut down its IMSA DPi program mid-season to partner with Le Mans legends Team Joest instead. Much of what was left at SpeedSource’s Florida shop, which includes everything from office supplies to tools to cars themselves, is now going up for auction through Key Auctioneers. We here at Jalopnik have a special thing for diesel Mazdas. Mazda took their diesel Mazda6 racing in Grand Am’s admittedly tiny GX class for alternatively-powered and new-tech vehicles, and we loved the idea from the start. It was a 400 horsepower diesel—on a road course! Nothing about that statement isn’t wonderful. If you’re forced to shop for a Jalopnik staff member (I’m sorry), here you go: chassis No. 012 has the engine included. It’s also red, which everyone knows is the best race car color. No. 70 was even the first diesel race car to win at Indianapolis Motor Speedway, so it’s near and dear to our weird, let’s-ignore-Volkswagen-for-a-sec, diesel-loving hearts. You want to be sure to get the one with an engine. Otherwise, we’ll do something stupid like try to see if it will run with an ill-advised, underpowered Type 4 swap. There you go. Holidays solved. Thank us later, but do buy us the car first.